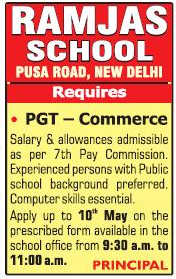 Ramjas School, New Delhi has advertised in THE HINDUSTAN TIMES newspaper for the recruitment of PGT jobs vacancies. Interested and eligible job aspirants are requested to apply with in 10th May 2018. Check out further more details below. About School: Ramjas RKP is a full fledged 3 section school with a total strength of more than 1900 students, with around a 100 Staff on roll. We are very consciously gearing ourselves to face the next millennium for the children with us today will be adults in a very different world and we need to prepare them for it.The need to develop an open, flexible, inter disciplinary and global curriculum has never been greater. Keeping this in mind we review our school programme periodically and incorporate these learning skills. We create as many opportunities as possible for this growth because for us each child who enters this school is somebody very-very special and that is the very essence and philosophy of this school.